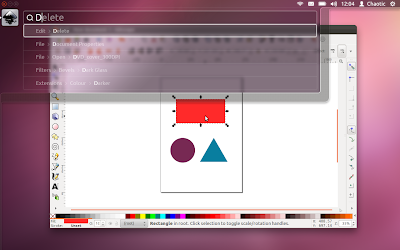 Mark Shuttleworth has just blogged about a new way to use applications menu. Called Head-Up Display, or HUD, this new feature will ultimately replace menus in Unity applications. HUD is a new means of invoking commands where users can search and launch menu commands from a console. It has a smart mechanism that prioritizes frequently used commands in list. Every application that support Ubuntu global menu currently will have the ability to use new HUD menus. HUD could replace traditional menus in 12.04 if it meets quality standards of an LTS release as still lots of work is needed to be done. However it can be available as an option where users will be able to use both traditional menus and HUD together. If HUD completely replaces traditional menus in final 12.04 release, users will still be able to turn it off to get global menu back on top panel.